The American Standard Champion toilet is a water-efficient toilet available in a number of colors and styles to fit your bathroom decor. These toilets eliminate waste from the bowl by means of a flush assembly that links the bottom of the tank to the bowl. With so many components in an American Standard Champion toilet flush valve, troubleshooting involves examining the different parts and replacing faulty ones. There are a number of components to check when troubleshooting a flush valve. 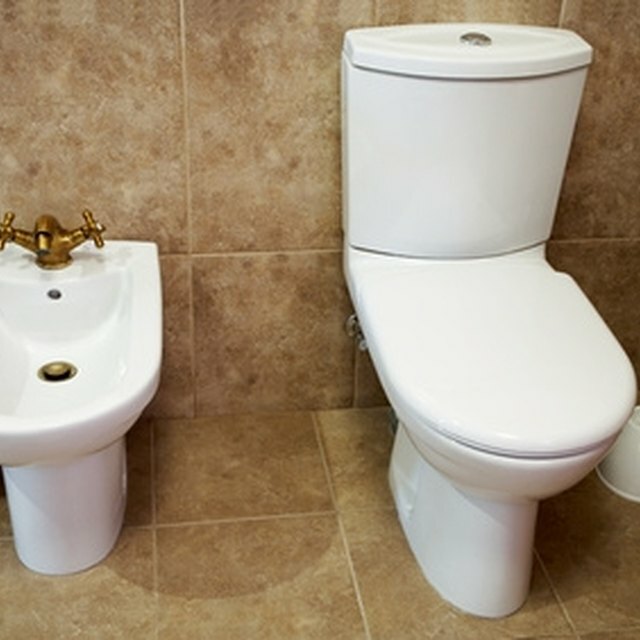 Turn off the toilet's water supply, usually a valve on the wall or floor behind the toilet. Twist the valve handle completely clockwise to shut off the water. Remove the lid on the American Standard Champion toilet tank and set aside. Flush the toilet, continuing to hold down the handle as the toilet flushes. This will drain most of the water from the tank. Unclip the overflow hose running from the top of the fill valve to the top of the overflow tube. Unhook the flapper chain connecting it to the tank handle rod above. Unsnap the flapper, either by pulling it off the hinges next to the overflow tube or pulling it off the top of the tube. Examine the flapper on the top and bottom. If it is cracked or damaged, replace. Before inserting the new flapper into the toilet, apply a coat of silicone grease around the bottom lip. Check the flapper chain for kinks and straighten it out, if needed. Replace a rusted or damaged chain. Loosen the nuts on the underside of the tank, using the wrench. Loosen the coupling for the water supply line on the underside of the tank by turning it counterclockwise with pliers. Lift the tank up and off the back of the toilet. Loosen the retaining nut on the underside of the toilet. Pull the flush valve assembly and overflow tube out of the bottom of the toilet. Check the gasket on the flush valve for cracks. Replace the flush valve gasket with a new one if the old one is damaged. Apply silicone grease to the underside of the new flush valve gasket before inserting the gasket into the bottom of the tank. Secure with the plastic retaining nut from the bottom. Lift up the tank and set it on the back of the American Standard toilet. Slip the tank bolts through the bottom of the tank so the washers on top of the bolt are resting on the tank floor. Secure from underneath with the tank nuts. Wrap the tank inlet on the bottom of the tank with plumber's tape. Reconnect the water supply hose and tighten the coupling with a wrench. Reconnect the overflow hose to the top of the overflow tube. Reconnect the chain from the flapper to the handle rod, if it is disconnected. Turn on the water supply. Tighten the tank bolts, if needed. Flush the tank and check that the flush valve operates properly.